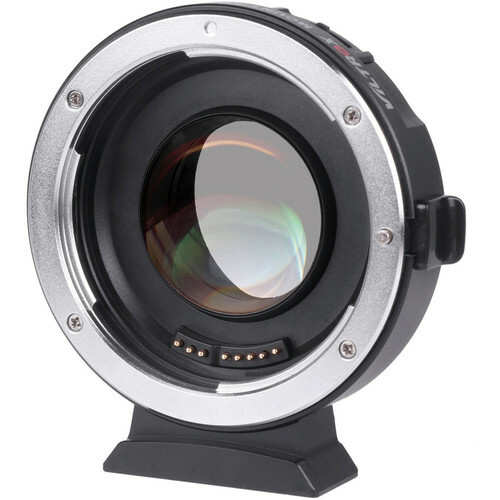 This 0.71x Lens Mount Adapter from Viltrox allows a full-frame Canon EF-mount lens to be mounted onto a Micro Four Thirds camera. While doing so, the adapter's optics help to maximize the connected lens's apparent angle of view while providing a one-stop increase for the camera over the lens's aperture range. If a lens intended for 35mm film or similarly-sized full-frame camera sensors is connected to a Micro Four Thirds camera, it would project an image larger than the camera's Micro Four Thirds sized sensor was built to accept. Able to capture only the center portion of the projected image, the effective angle of view of the lens would be narrowed, creating an in-camera "crop factor." This adapter condenses the light from a lens designed for 35mm film or "full frame" camera sensors and projects it onto a Micro Four Thirds camera's Micro Four Thirds sensor. This allows the Micro Four Thirds sensor to utilize more of the light gathered by a connected lens, which effectively reduces the crop factor while making available to the sensor an additional one stop of light for each of the lens's f/stop settings. If a compatible lens includes autofocus, as well as camera-controlled aperture functions, this adapter is intended to allow those features to be used. Also, if an attached lens is capable of generating Exif metadata when used with a directly compatible camera, this adapter is designed to allow that information to be saved along with image files generated with a combination of the lens, a compatible Micro Four Thirds camera, and the adapter. This adapter is constructed with four lens elements in four groups that are designed to provide optical clarity as well as color fidelity, and the underside of its detachable tripod foot is tapped with a 1/4"-20 accessory thread, enabling direct attachment to tripods or quick release plates that feature 1/4"-20 mounts. For ease of upgrading its firmware, this adapter also includes a micro-USB port. Box Dimensions (LxWxH) 4.5 x 4.0 x 2.5"
Do the electronics work on a Blackmagic Pocket 4K?